The Comodo Guarantee is available to customers of CIS Pro and CIS Complete versions. Before enabling guarantee coverage, customers should first have activated their license. 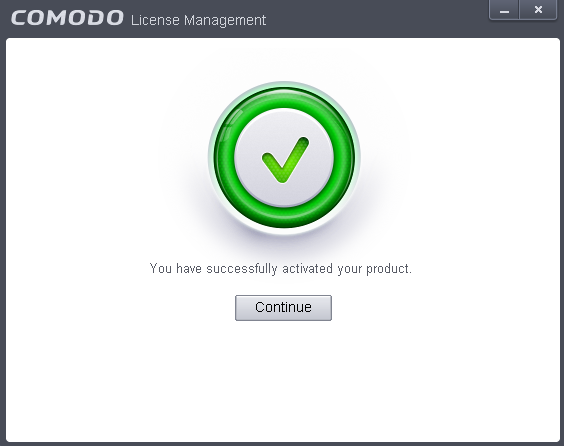 Full details on activating the license can be found in Activating Your License section. The actual cost of a Comodo specified and authorized third party provider to repair the computer to an operating condition ('Guarantee Limit'). The guarantee is limited to repairing the computer over the Internet to an operational state and excludes all claims for lost or expected profits, lost or corrupted data, lost or deleted work, or lost or damaged personal files. 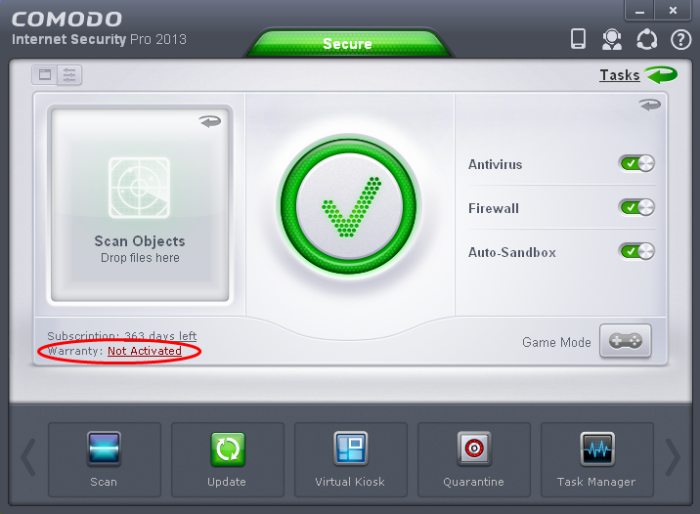 Comodo does not guarantee against the loss of any file or information. The guarantee is void if you breached this agreement, failed to follow the procedures described in this Section 3 of the EULAor failed to pay any fees applicable to your use of the Software. Important Note:Before activating the guarantee, it is essential to run a full computer AV scan with the latest version of the Comodo Virus database in order to ensure that your system is eligible for the Guarantee coverage. Make sure that the virus database of your CIS installation has been updated to the latest one. The update status is indicated next to 'Last Update' in the 'Virus Defense' box of the CIS main interface and with a green tick mark and the text 'All Systems are active and running' in the lower left corner of the main interface. If your virus database is not up-to-date, click the link next to 'Last Update' in the 'Virus Defense' box to update to the latest version. Then run a full computer scan from the Antivirus Tasks interface of the CIS. 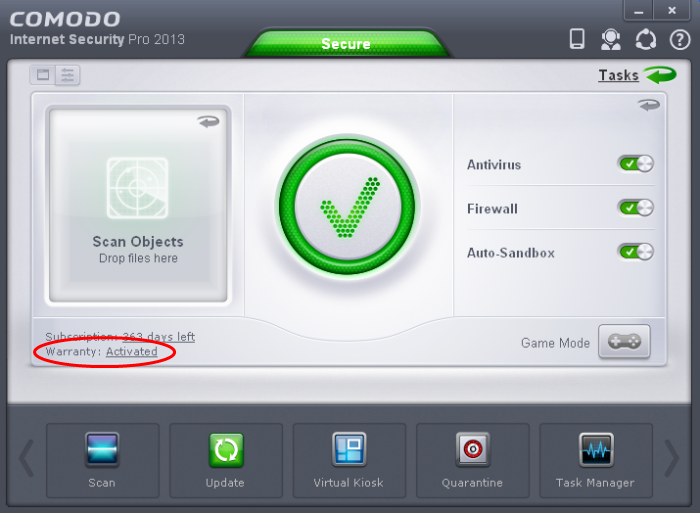 For more details on running an Antivirus Scan Click here. Step 1: To activate your guarantee coverage, click 'Not Activated' beside 'Warranty' in the home screen. A full system scan to remove all known viruses is a mandatory requirement if your computer is to be eligible for guarantee coverage. If this step has already been performed (and your system is clean), then the process moves to step 2. Click 'Yes' to run a full computer scan. Refer to the section Run a Full Computer Scan for more details on scanning your full computer and cleaning the infected files. All the infections and threats identified during the scan should be cleaned for your computer to be qualify for the warranty. Click 'Not Activated' beside 'Guarantee:' again. The Guarantee Activation Wizard will start and on completion the 'successfully activated' screen will be displayed. Successfully activating your Guarantee will change the information displayed beside 'Warranty:' in the Home screen.